Kawai may be well known for their line of premium instruments, but they are not usually in the conversation about entry-level electric pianos. This is why the KDP110 is such a noteworthy instrument—it combines Kawai quality with a price tag suited to entry-level players. Replacing the now discontinued KDP90, this instrument comes with important upgrades and a great set of features. The KDP110 is surely an exciting addition to Kawai’s line of great-sounding and feeling digital pianos. But does it live up to the hype? 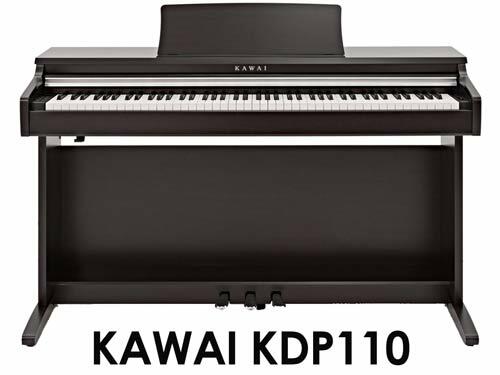 Note: In regions, this instrument is marketed as the Kawai CN-17, which is basically the same piano as the KDP110 but available in different colors. The 88 key KDP110 is a home piano and not designed to be easily transported. However, it is a great piece to have around your house—elegant, simple, and by and large understated in appearance. This piano that I saw was a very dark brown, reminiscent of traditional acoustic pianos. It also comes in black and in white, though these colors are only available in certain countries (not in the US). This is not what I would call a sleek piano, but neither is it overwhelmingly bulky. It is well-constructed (weighing in at 86 pounds), and is nearly 16 inches deep. At 53.5 inches tall and 33.6 inches wide, this piece is not the kind of thing you or your guests will be able to ignore in your home—it is surely another piece of furniture. The KDP110 comes with what Kawai calls the Grand Feel Pedal System, which recreates the weight and position of the pedals found on the Kawai SK-EX concert grand, providing a realistic pedaling experience. And it’s very nice to see something like this on a budget-friendly instrument such as the KDP110. The KDP110 has the standard three piano pedals – sustain, sostenuto, and soft. 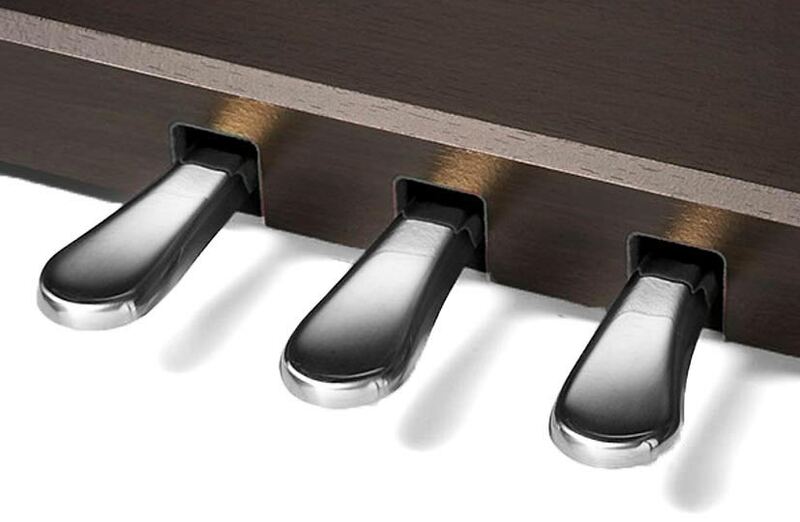 The sustain pedal supports half pedaling which more experienced musicians will appreciate. The good thing about most furniture-style digital pianos is that they come with a keyboard cover, and this piano is no exception. The KDP110 is equipped with a sliding key cover which helps to keep the keys away from dust and dirt when the piano is not in use. It is nice sometimes to have something simple, and in the case of this instrument, it helps the company keep the price tag lower. I have always appreciated gear that just works at the push of one or two buttons. This is the sort of design you will find with the KDP110, although it does sometimes mean that you have to memorize button sequences to get where you’re going. In this case, it isn’t terribly arduous since there aren’t so many sounds to choose from to begin with (compared to some higher-priced models that really do need touchscreens to be easily navigated). But, it’s still would be very helpful to at least have the names of the sounds and functions printed above the keys so that you don’t have to refer to the manual each time you want to change a sound or a setting. 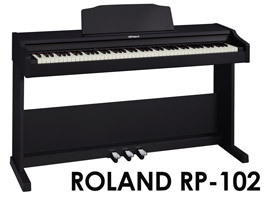 As with many pianos in this price range, there isn’t a screen to be found on the KDP110. Even the control panel is simple—a few buttons and nothing else. Beside that, there is very little in the way of adornment on this instrument. That may be to your liking, it may not, but it is rather standard fare for an instrument of this class (and really for digital pianos in general, which are designed visually to replicate the look of acoustic uprights). The KDP110 has a full-size 88-key keyboard. The action of this keyboard is called Responsive Hammer Compact II action. While this is an entry-level piece, Kawai has tried to make the keyboard feel nearly as good as premium pianos, and the RHCII is not an entry-level action. For the price, it has an impressive feel overall and adds significantly to the quality of the instrument. This action is a 3-sensor version of the ES110’s action. The fact that it is 3-sensor improves its responsiveness, particularly when you are playing passages that require a lot of speed and a light touch. I’ve also noticed that the RHCII is less bouncy, quieter, and a little bit heavier compared to the RHC, which gives it a more substantial feel. The keys are both weighted and graded, which makes for a natural feel that simulates an acoustic piano. The feel of the KDP110’s keyboard is somewhere between heavy and light, though it leans more in the direction of lightness. It’s lighter than Yamaha’s GH3 action (used in the YDP-164), and a little lighter than Roland’s PHA-4 Standard (RP-102, F-140R). It is marginally faster and more responsive, albeit also slightly bouncier, than the above keyboard actions. In terms of weight and feel of the keys, I’d say the RHCII is closer to Korg’s RH3 and Casio’s Tri-sensor Scaled Hammer action, though they all feel slightly different and you need to play them to see which one feels the most natural to your fingers. You can adjust touch response of the keyboard to better suit different players and different styles. There’re the Light, Normal, and Heavy preset settings. You can also turn the touch sensitivity off so that the instrument produces the same amount of volume no matter how hard or soft you play the keys. The keys themselves are made of plastic, and they have a matte finish (both white and black keys). I found this finish to feel quite natural and aid in grip. Overall this may be one of the best actions on the market for entry level pianos. There is very little left to be desired here, particularly for a piano at this price point. Kawai has done a great job injecting some of the quality of their well-known premium keyboard actions into an entry-level instrument. As you would expect from Kawai, the sound quality here is top notch. The KDP110 features Harmonic Imaging sound engine, which uses stereo samples from Kawai’s famous Shigeru SK-EX 9-foot concert grand piano captured from each key at different velocities. The sound of the SK-EX grand is the main piano tone on the KDP110, which is also named “Concert Grand”. This is the sound you’ll hear when you turn on the instrument and start playing. It’s a very deep, nuanced tone that is a joy to listen to. In most cases, it would be hard to tell on a recording whether you were playing this instrument or an acoustic one. And that’s the point, after all, isn’t it? Though Kawai have more advanced technologies in place for their higher-end instruments, this one stands up well against virtually all entry-level competitors. The KDP110 is Kawai’s most affordable digital piano that offers the Shigeru SK-EX samples. The ES110, which is the younger brother of the KDP110, uses samples recorded from the world’s acclaimed Kawai EX Grand Piano. They both sound wonderful but, to my ears, the SK-EX has something raw and unique in its character, which makes the sound even more interesting and satisfying. Pianos aren’t the only sounds available on the KDP110. What makes the KDP110 stand out from the competition is its Virtual Technician feature. What it does is it allows you to change the character of the tone to better suit playing different music genres and your personal preferences. There are two ways you can use this feature. One is to use Virtual Technician in Smart Mode, which provides you with preset settings that virtually adjust various characteristics of the piano sound such as Touch Response, Damper Resonance, Hammer Response, Brilliance, etc. changing the character of the sound. There are 10 preset settings available within the Virtual Technician (Smart Mode): Noiseless, Deep Resonance, Light Resonance, Soft, Brilliant, Clean, Strong, Dark, Rich, Classical. If you feel that you need more control over the tone and want to adjust the elements individually, you can download the Virtual Technician app (available for iPad) and change 13 different parameters using an intuitive graphical interface. 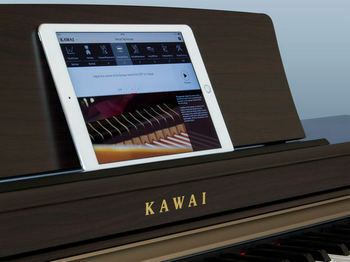 It’s the way that Kawai gets around the minimalism of its control panel—allowing you to control elements of its sound remotely from the app, which can be connected via Bluetooth. The app will also explain what each parameter means and how it will affect the sound. Responsiveness of the keyboard, or in other words, how much force you need to apply to play the loudest sound. The overall tonal character of the piano. Adjusts how much damper resonance is applied to the sound. Damper resonance occurs when you depress the sustain pedal and all dampers lift off the strings allowing them to resonate sympathetically with the ones that you actually play. The prominence and length of the noise occurring when you release a key and the damper falls back on the string. Allows you to change the perceived delay of the hammer before it strikes the string, or in other words, a delay between when you press a key and when the sound is produced. Adjusts the position/angle of the lid of the grand piano, which makes the sound more open or dark. This parameter adjusts the rate of decay, or how long the note will sound while you keep your finger on the key. Adjusts the minimum force you need to apply in order to produce a sound. A tuning method used my piano technicians to tune the piano where the lower octaves are tuned a bit flatter, and the upper octaves are tuned a bit sharper. Adjusts the point where the sustain pedal becomes effective and start sustaining the notes. Most modern acoustic pianos these days use the standard “Equal Temperament” but you can also use other tuning methods used in the past to better suit playing certain music genres. 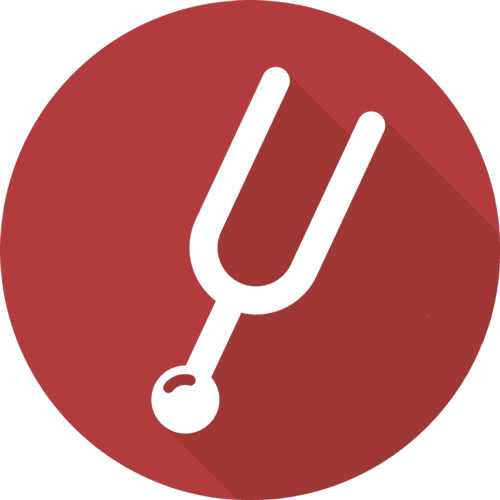 There are also some parameters and effects that you can adjust from the instrument (no app needed). For example, you can adjust the brightness of the sound within the -10 +10 using the “Brilliance” setting. To add more reverberation to the sound and make it bigger and wider you can choose from 6 different reverb settings that simulate various acoustic environment including: Room, Lounge, Small Hall, Concert Hall, Live Hall, Cathedral. One of the new features on the KDP110 is the Spatial Headphone Sound feature. 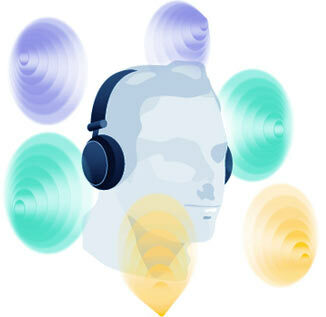 What it does is improves the listening experience when you use headphones by adjusting the depth and spacing of the sound. There are 4 preset settings you can choose from including the Forward, Normal, Wide, and Off. Another useful setting is called Phone Type that allows you to optimize the sound depending on which headphone type you’re using (Open, Semi-open, Closed, Canal or Inner-ear). Other parameters that you can adjust via the control panel include Damper Resonance and Touch Response. The KDP110 is equipped with 192-note polyphony, which ensures that you’ll hear every detail and nuance of your performance. Pretty much all digital pianos at this price point have either 128- or 192-note polyphony, which is more than enough in most situations, even when you layer several sounds on top of each other, play along with the preset songs, etc. The KDP110 features two 20-watt speakers, which are definitely loud enough to do the job of conveying an acoustic piano sound. 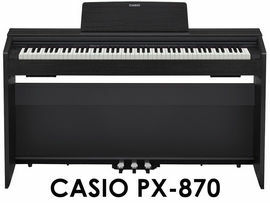 In fact, in this price range, only the Casio PX-870 with its 40W speaker system can compete with the KDP110 in this department. So compared to other digital pianos in this price range, these two will likely to outperform them in terms of maximum volume and boldness (though you won’t probably use any of these digital pianos at the maximum volume, as they do get quite loud). Overall the sound of this piece, particularly when you combine its sampling technology with the ability to tweak elements of the sound remotely, is quite impressive and may be the best in its class. As with most console digital pianos in this price range, you would expect there not to be a whole lot going on in terms of onboard features. And you would be right. The KDP110 is first and foremost designed with piano players in mind. You won’t find a wide selection of built-in tones, recording features, accompaniment styles, and other so-called bells and whistles. But I can’t say the KDP110 is lacking anything in this department either. There are still quite a few useful features here that you can take advantage of. Let’s take a look! 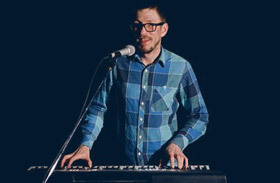 As with most digital pianos these days you can use the keyboard of the instrument in different ways. Dual Mode will allow you to layer two different tones on the KDP110 so that they sound simultaneously when you play the keys. You can also adjust the volume balance to make one instrument louder than the other. Four Hands Mode (aka Duet Play, Duo Mode) might be useful for people who like to play duets or in the class environment where you can play the same notes with your teacher simultaneously sitting next to each other. What this mode does is splits the keyboard into two equal parts. Each part has the same octave range and its own middle C.
Unfortunately, the KDP110 doesn’t have a Split Mode. This means you won’t be able to assign a different sound to the left and right-hand sections to play two sounds at the same time. There is an onboard MIDI recorder, but it isn’t multitrack, and it can only record 3 songs. This is still useful (and enough in most situations), but in an age where an entire multitrack DAW can be held on a tablet (or even a phone), it is a little surprising (even though it is frankly common at this price range). The KDP110 also has some cool features for learners, which you won’t find in many digital pianos at this price point. Unlike instruments of other makers that come with preset songs, the Kawai comes with built-in song books. It isn’t a self-contained lesson-system, but it allows the user to hear a given song played on the piano while seeing it on the page. It also allows the left and right hands to be separated and learned individually, which is something I wish I had when I was learning. Note that the books themselves are not included with the piano, and you’ll have to purchase them separately (if you want to see the scores of the songs). All of these books are widely used in teaching beginner and early-intermediate students, so you might want to consider buying them anyway. The cool thing is that all the songs and exercises from those books are already built into the KDP110 so you can listen to them, practice, etc. Another educational feature built into the instrument is called Concert Magic, though I find it more fun than educational. 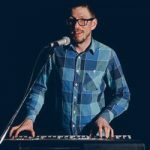 The Concert Magic includes 40 songs that you can play by simply pressing any keys on the keyboard with a steady rhythm and tempo. Depending on the difficulty level, you can choose from different arrangements types: Easy Beat, Melody Play, and Skillful. Since you don’t actually learn any songs using this feature (you can play any keys), I wouldn’t call it a very useful learning tool. But for complete beginners, it can be an easy and entertaining way to start their musical journey by practicing their rhythmic skills and getting familiar with different music genres. 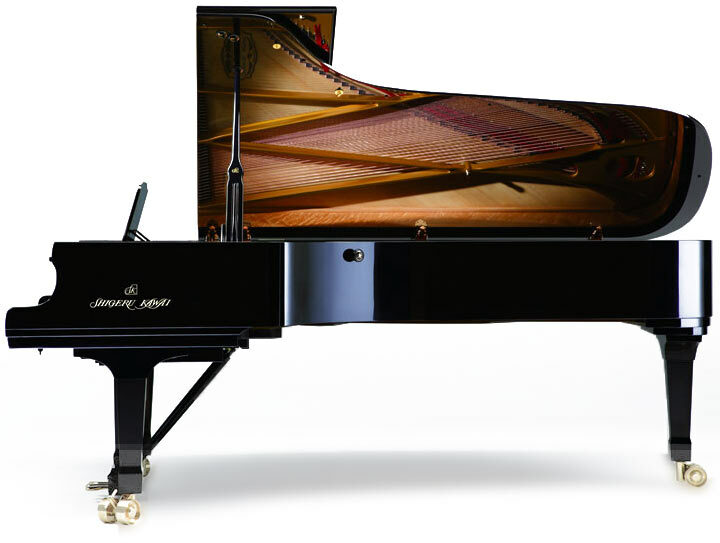 All standard features such as Transpose, Master Tuning, and Metronome are also built into the piano. The metronome has an adjustable tempo, time-signature, and volume. Connectivity is important in 2019. No device lives all by itself: we connect them to speakers, computers, phones, tablets, and whatnot. And when it comes to connectivity, the KDP110 doesn’t disappoint. On the front, right below the keyboard, you’ll find two headphone jacks (one is 1/8″ and the other one is 1/4″), which you can use simultaneously when playing duets for example. There are no dedicated Line Out jacks, so if you ever need to connect external speakers or amplifier to the KDP110, you’ll have to use one of those headphone jacks. The rest of the connectors are located on the right center underneath the keyboard. There you’ll find a USB type B (aka USB to Host) port, which you can use to connect to a computer or a smart device to control various MIDI compatible music apps such as GarageBand, FlowKey, Playground Sessions, etc. The good news is instead of using the USB port you can connect to your smart devices wirelessly via Bluetooth, which means no cables and less hassle. 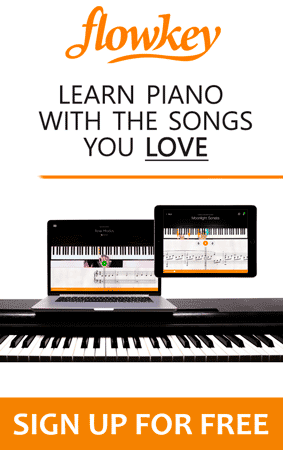 As of March 2019, only Roland and Kawai equip their entry-level digital pianos with Bluetooth MIDI, which I think is a very handy feature that more digital pianos should have. It’s 2019 after all! The piano also features MIDI In and Out ports, which you can use as an alternative to the USB port (some people actually prefer MIDI ports), or to connect to other MIDI-keyboards, audio interfaces, sound modules, and other audio gear. 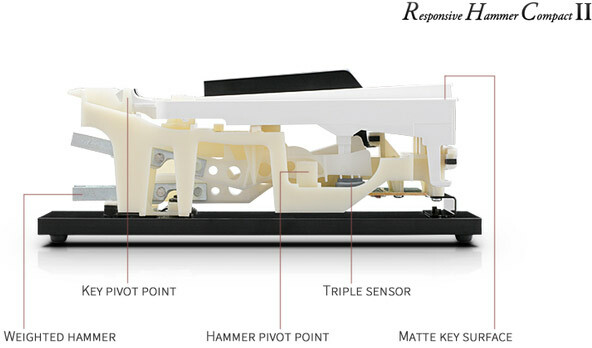 The overall connectivity design of this piano is, as the whole design is, simple. But it does what it needs to do, and that’s all we really need here. Note: Check out our MIDI Connection Guide to learn how to connect your digital piano to a computer, iPad or Android device and see what you can do once you’ve connected. When it comes to benches, there are tons of options available out there – cheap and expensive, adjustable and non-adjustable, with and without storage for sheet music, made from genuine leather, faux leather, fabric, and so on. Overall, the KDP110 is an impressive offering by a great company. And it can be had at a great price. I recommended it for beginners and intermediate players more than any others, but to be honest, any player can sound good in it. No player is too far along to make use of the realistic sounds and authentic feel of this instrument. In the end, beyond all the accouterments and flash, a digital piano is meant to sound and feel as close to an acoustic piano as possible. And this piece does that. The KDP110 is for home use, and that is how I will recommend it. You aren’t going to want to break it down and set it up on stage. But once you have it set up (which, by the way, requires 2 people to do without extra effort), it is a great instrument for almost any player who may be on a bit of a budget. This is also a great instrument for learners — particularly when you include the realistic fully-weighted keyboard and lesson functions. I recommend it highly for anyone looking for an introductory digital piano or anyone looking for a piano in this price range for any reason. It is hard to go wrong here. There are quite a few things that set the KDP110 apart from the competition including the powerful onboard speakers, fully-customizable piano sound (Virtual Technician feature), Bluetooth connectivity and built-in lesson books. So, if you’re on the market for a home digital piano under $1500, definitely add the Kawai KDP110 to your list. There are a lot of worthy competitors to the Kawai KDP110 in this price range to consider. Let’s focus on the ones that come the closest to the Kawai in terms of design, features, and price. Korg and their recent C1 Air and G1 Air models have upped the game in the entry-level segment of the digital piano market. They’re both really good instruments that feature Korg’s best hammer action (RH3) used in their pro-grade keyboards and workstations (Kronos, Grandstage, etc.) as well as 30 high-quality tones including 3 of the world’s famous grand pianos – Austrian (G1 Air only), German, and Japanese. Another notable feature of the C1 is its powerful 50W speaker system, which you won’t find in any digital piano at this price point. I also like the elegant design of the C1 with the front supporting legs which add to the look of the instrument. From the standpoint of the playing experience, the C1 and the KDP110 are quite similar. But as with many digital pianos of different makers, you’ll find that each of the instruments has their own unique character (sound-wise and feel-wise). To me the RH3 action of the C1 Air felt a bit heavier and more realistic than the Kawai’s action. It also seemed to have a bit longer keys (invisible part) and “higher” pivot point which made it easier to play towards the back of the keys. With that said, the Kawai RHII action is a bit quicker and bouncier, which some people might actually like and prefer. So I do recommend playing both of these keyboards to decide which one you prefer. You can’t really go wrong here, as both of these actions are arguably the best entry-level hammer key actions (along with Roland’s PHA-4 Standard key action). Sound is also quite subjective and can be difficult to evaluate depending on what headphones, onboard or external speakers you’re using. Plus, the instruments use samples of different grand pianos, which obviously makes their sound slightly different in character. The KDP110 is a definite winner when it comes to sound customization, as it allows the user to change quite a few sound parameters. The Korg C1 offers much fewer options in this department. Now let’s take a closer look at some of the other unique features of these two pianos and the main differences between them. Being a very successful model in Roland’s arsenal, the F-140R is another contender that you might want to add to your list. Unlike the KDP110 that has a more traditional look, the F-140R is a slim modern styled piano that you’ll be able to fit in virtually any room. The F-140R comes with Roland’s PHA-4 Standard keyboard with 3-sensor detection mechanism, ivory touch keys, and escapement action. Overall, it’s a really good action, which I’d place between the Korg’s RH3 and Kawai’s RHII actions as far as my personal preference is concerned. 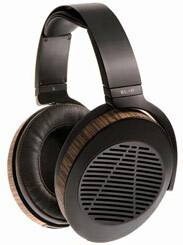 Nevertheless, they are all high-quality actions and are definitely among the best you can get under $1500. If you prefer a lighter and quicker action, you’ll probably like the RHII action of the KDP110 the most. The RH3 and PHA-4 Standard felt slightly heavier to my fingers, though they are still very responsive and aren’t stiff by any means. When it comes to tone generation, the F-140R features Roland’s famous SuperNATURAL sound engine that uses samples coupled with modeling technologies, recreating the deep complex sound of a grand piano. Roland digital pianos are known for their bright rich piano sound, which some people find a bit too bright, but you can easily adjust the tone using the Brilliance and Ambiance settings, so I don’t see a big problem here. Apart from that, the F-140R sounds wonderful, and unlike the KDP110 and C1 Air, it reproduces Sympathetic String Resonance which makes the sound even more full and natural. Let’s see what other differences the F-140R and KDP110 have. 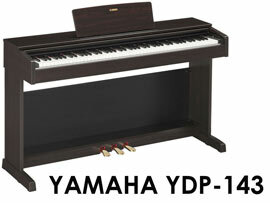 Yamaha has just updated their YDP series by introducing the successors to the hugely popular YDP-143 and YDP-163 models. 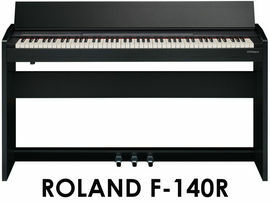 The new YDP-144 and YDP-164 digital pianos are not a great deal of improvement compared to the previous models. The biggest change you’ll find is that the new instruments come with piano tones sampled from the Yamaha’s flagship CFX Concert Grand as opposed to the Yamaha CFIIIS used in the older models. Other than that, they are pretty much the same pianos. The Yamaha YDP-144 features Yamaha’s Graded Hammer Standard (GHS) action, also found in their portable P-45 and P-125 models. It’s a decent entry-level action which Yamaha has been using in their digital pianos for well over a decade. In my opinion, the GHS doesn’t feel as good as the actions of the Kawai, Korg, and Roland pianos mentioned above. To me, the GHS is a bit springy and mushy, which makes it less realistic and a bit harder to control. I also found it harder to play closer to the back of the keys (shorter pivot point) on the GHS, which can be a big deal if you’re an experienced pianist (if you’re just starting out, don’t worry about that too much). If you’re an intermediate player, I’d recommend checking out the Yamaha YDP-164, which is a bit more expensive than the KDP110 but is also more much more realistic than the YDP-144 as far as touch is concerned. So I feel that the YDP-164 is a better competitor to the KDP110 than the YDP-144 even though price-wise the KDP110 is closer to the YDP-144. Great review as always. I have read plenty of reviews here and I finally decided to get a Roland fp30 instead of Kawai es110, despite not being completely satistified with the sound of the fp30. I like the feeling and both the lower and higher register, how ever, I can’t stand the middle octave, especially E4. I am thinking of returning it and get the kdp 110/cn-17 and there are no possibilities for me to try it anywhere, so I would really like som help. I had to buy both a stand and pedals for my fp30 and that almost made it a similar price to this kdp 110. What do you think I should do? what digital piano sounds and feels more similar to an acoustic piano of the fp30 or kdp 110? Hi Simon, I can’t tell you if you’ll like the tone of the KDP110 more than that of the FP-30, as only you can find that out by listening to both of these pianos. To me, they are both really good instruments in their price categories. I prefer the feel of the FP-30, while the KDP110 sounds slightly more natural to my ears. The KDP110 has a slightly lighter action compared to the FP-30, so again depending on what feel you prefer, this can be a factor. I decided to return the fp30 and get a cn-17 instead, since I really like the deep sound instead of this bright metallic one. I guess that the key action is good nonetheless. Thanks for your help. Hopefully I can settle with the cn-17 now. I hope you like your new CN-17 better than the Roland! By the way, have you tried playing around with the Brilliance setting on the FP-30? It should be able to make the sound more mellow and less metallic. I actually thought the sound of the FP-30 is deep and rich, and when I adjusted the brilliance/ambience settings it actually sounded quite nice. But yeah, as I said it’s all very personal.